We have a special beer dinner coming up on the evening of Tuesday, July 17th. 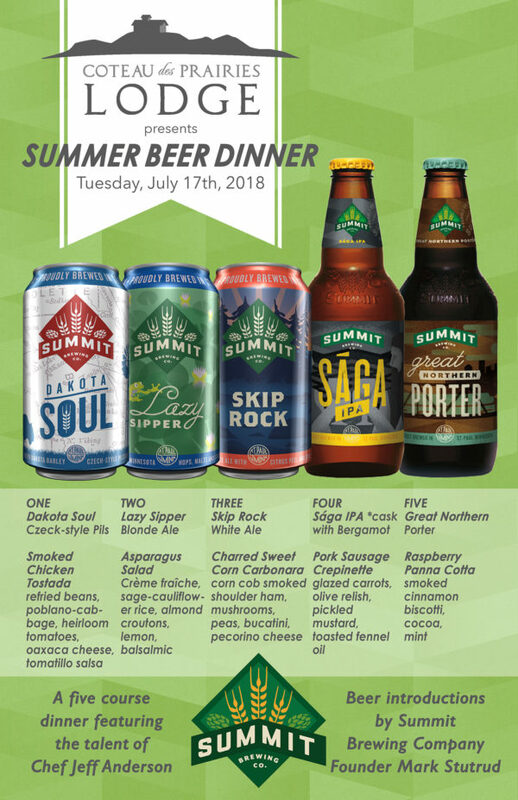 We are featuring five great craft beers from Summit Brewing Company (St. Paul, MN) paired with a five course dinner prepared by returning guest chef Jeff Anderson from Blue Plate Restaurant Co. (Minneapolis, MN). Mark Stutrud, founder of Summit Brewing Company and North Dakota native, will be joining us for the evening to introduce his delicious beers. In addition to Mark, we will be hosting the North Dakota barley growers behind Summit’s new Dakota Soul Czech-Style Pilsener. Josh and Todd Stutrud are Mark’s cousins from near Rugby. They are the exclusive growers of Moravian 37, the barley produced and malted specifically for Dakota Soul. That is why there is a map of North Dakota on every can, bottle and box of Dakota Soul! At our Summer Beer Dinner, you will have the chance to try a one-of-a-kind beer. Summit is bringing a one-off firkin of their popular Sága IPA which was brewed in the usual manner, but then infused with bergamot (at the request of Chef Jeff) and cask conditioned to perfection. We will tap it together at the dinner! Mark Stutrud. Courtesy of Summit Brewing Co. There is more to the Dakota Soul story (see above) than just the barley. Mark Stutrud grew up in Wahpeton and attended the University of North Dakota. He even lived in Sargent County for 6 years as a young child when his father Odin Stutrud owned and operated The Sargent County Teller! 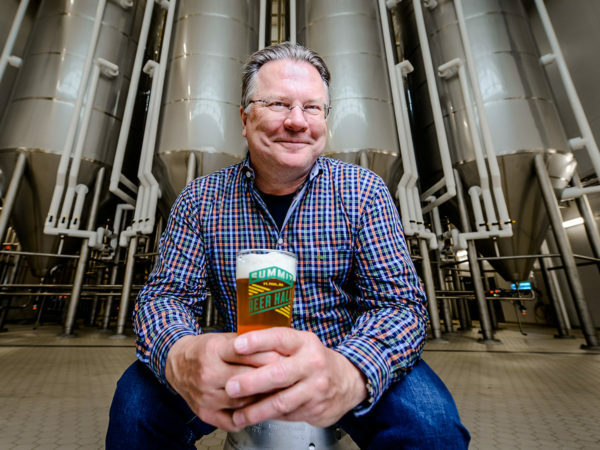 Mark moved to the Twin Cities and founded Summit Brewing Company in 1986. We look forward to hearing stories from his 30+ years of brewing along with stories of growing up in North Dakota. Back in 1986, before craft brewing was even cool, Summit Brewing Company Founder and President Mark Stutrud set out in St. Paul, Minnesota, to make craft beers inspired by old-world brewing traditions and ingredients. Over 30 years have passed since he first brewed the flagship Summit Extra Pale Ale, and it’s safe to say he nailed it. Today, Summit Brewing continues to infuse traditional recipes with modern ingredients from around the world, crafting high-quality and consistent craft beer out of respect for the hardworking folks who enjoy Summit beer. Jeff Anderson is the Corporate Chef at Blue Plate Restaurant Co. and has served as Executive Chef at numerous celebrated Twin Cities restaurants including The Lowry and The Freehouse. His amazing ‘cooking from scratch’ style has earned him quite the following. Jeff makes everything in house and that will be the case for our Summer Beer Dinner. Everything on the menu is made fresh just for the event. Jeff is a familiar face in the kitchen at Coteau des Prairies Lodge where he has already put together some incredible beer pairing dinners. His previous pairings at the lodge featured Brau Brothers Brewing Co., Lucid Brewing Co., Fargo Brewing Co., Fulton Brewing Co. and Fernson Brewing Co. The event is on Tuesday, July 17th at Coteau des Prairies Lodge. Everyone is welcome, but space is limited and meals are available by reservation only. Alcohol will be served only to those over 21 years of age. The price is $70 per person. The meal includes a gourmet five course meal and 6 oz. of beer served with each course. Water and coffee will be provided. Sodas and additional alcoholic beverages will be sold at the bar. Doors open at 5pm, guests are welcome to come early, tour the lodge and enjoy refreshments served at the bar. When you arrive at the lodge, sign your party in with our hostess. Guests will be seated for the meal promptly at 6pm.